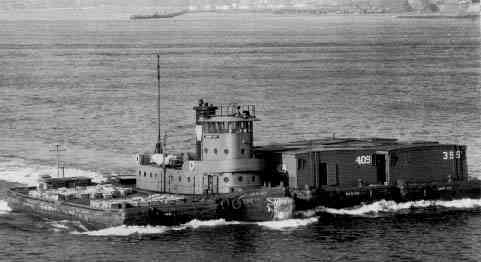 The rail-marine era was to end within the decade in December, 1961, but you would never know it from the way Pennsylvania RR tug Jersey City is plowing forward with three barges side by side. There are two wooden covered barges on the tug's port side. On the right is "Miss Liberty". This photo was provided by the Public Relations Department of the Port of New York Authority in 1975; most of the Authority's archive of negatives was lost in its move to the World Trade Center. In this case, the photo taken at an altitude of 100' at 10:30 am on 12/1/61 had a Public Relations Files rubber stamp across it which Mike Trubow has digitially removed. Railroading Along The Waterfront with Walthers. historical and operational information of those marine services associated with railroads. The Rail-Marine Information Group (RMIG) is an organization of people from around the world with a common interest in the history of the transportation of railroad equipment across water. RMIG was organized to share knowledge and information gathered by its members.